The Linnworks Data Import tool has been deprecated, and replaced by the Linnworks.net Automated Data Import and Export functionality. It should be used instead of this tool. 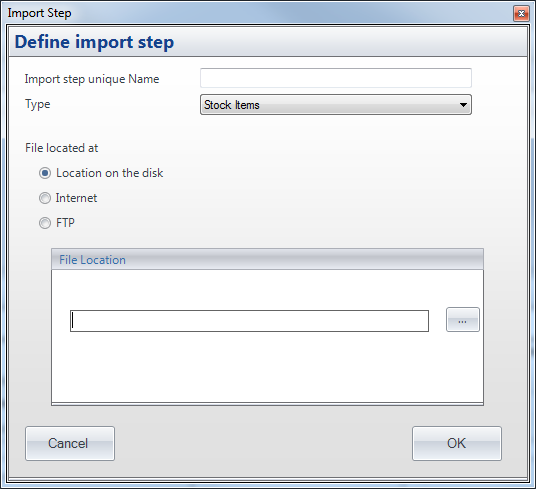 The Linnworks.Net import functionality also includes the ability to set up automated imports. The ability to set up automated imports is still available in Linnworks Desktop, and a guide explaining how to set up such an import can be found below. You can set up the system to import the data every time you synchronize (click Sync button). This is particularly useful to import new orders coming from different sources for which the direct integration is not always possible (for example your website which is hosted on third party cart provider). Below we describe how to set up automatic import of order from the web, the Order Book import process imports orders only once, therefore the same file can be brought in as many times as you like and only new order will appear on the system. In Linnworks, go to Settings > Import / Export Automation > Data Import. 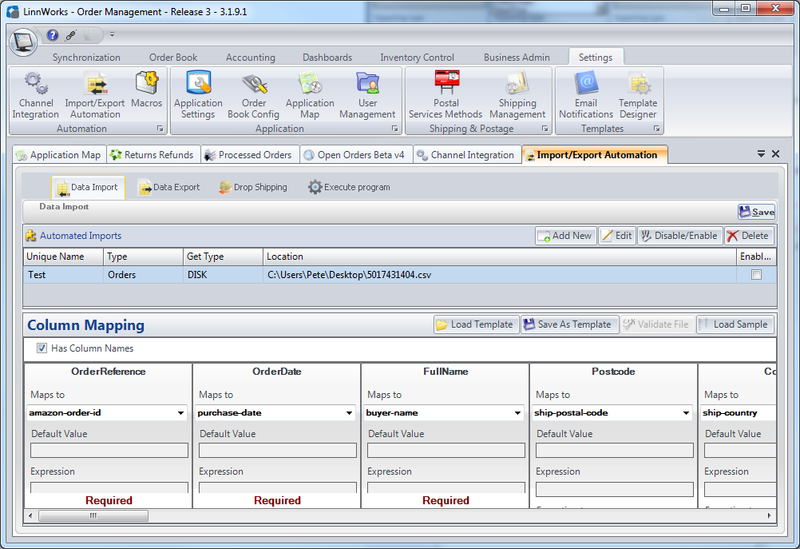 Specify column mapping, the same as for one-off import. You can load prepared template. Where join is a function that takes some parameters. This expression will create a text value that combines all three fields with spaces separating the imported title, surname and first name. If your import file header fields contain spaces (not recommended) then please use the following expression as an example where first name and last name would appear with a space between them in the imported field. For more information on expressions see the Expressions documentation. Note: Order Import requires the Status to contain either PAID or NOTPAID, all other statuses will be ignored and the order will not be imported. You will need to change the cost to the same name as the column header in your import file, this is the same for Quantity. Note: If you do not import a stock value it will default to zero so it is a good idea to import the calculated stock value when you import. KB: Data import returns error Error parsing flat file Get field count An item with the same key has already been added.